Move over, Bobby's Room. There's a new big game in town. The $200/$400 mixed game that runs in Aria's posh Ivey Room is the modern version of the legendary Bellagio Big Game. It's smaller, younger, and more aware of its image. It's what happens when the economy hits the nosebleed games, Twitter demands a more accessible high-stakes show, and a new, discerning consumer insists on being treated like royalty while he wagers enough to make the average home game dizzy. Aria has wooed some of poker's biggest names with top-notch service and the help of an unlikely spokesman: Jean-Robert Bellande. With Bellande's cheerleading, the game has become a daily staple at Aria and a major part of the poker room's plan to turn itself into Las Vegas' new must-see poker destination. The $200/$400 game may not rival the legendary $2,000/$4,000 games of years past, but those stakes have largely disappeared from the live felt. Now the Ivey Room hosts the biggest game that runs regularly in Las Vegas. It usually starts as a $200/$400 seven-game mix, though the stakes and the games are flexible. The game's regulars show up six days a week to play limit hold'em, Omaha hi-lo, stud, stud 8, badugi, triple draw, and capped no-limit single draw, but they are always willing to shuffle the line up to accommodate new players. Phil Hellmuth, Todd Brunson, Barry Greenstein, Brandon Cantu, and Eli Elezra have all clocked time in the game, and Shaun Deeb has become a regular. Since being named Aria spokesperson at the beginning of August, Bellande has been traveling the European tournament circuit, but otherwise, he's rooted to his chair in the Ivey Room. It was his idea to bring the game to Aria. Bellande decided he wanted to play in The Strip's newest poker room, and he invited his friends and regular opponents to join him. Deeb said Bellande invited him via twitter. "I came in once and got hooked on the game," Deeb said. Eventually, a few Bellagio regulars decided to check out the new game down the street. 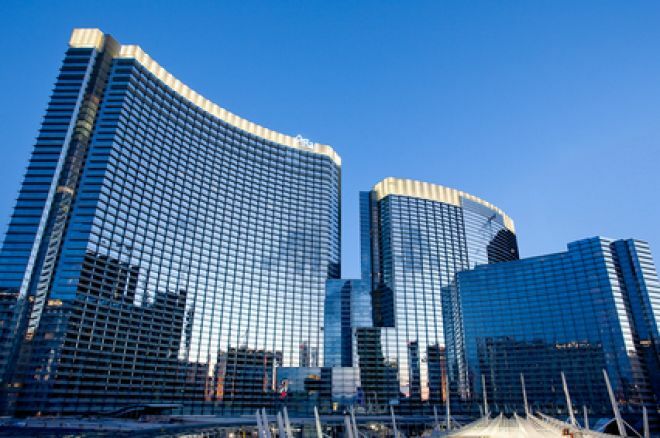 Although there has been some grumbling about the natural competition between the poker rooms at the two neighboring MGM properties, "We didn't go out and steal this game," said Adam Altwies, Aria's Manager of Poker Operations. "When they started playing here, all we did was provide them service and hospitality that is second to none." It's tough to beat the perks of playing in the Ivey Room. Once you enter the huge glass doors, the noise of the casino melts away. With only one table, the Ivey Room provides quiet and privacy for players without isolating them from the action outside. High rollers get comfortable chairs, private televisions, and richly decorated sanctuary to relax in while they play. Aria has the only poker room that offers high-stakes players a private entrance through which they can access their safe deposit boxes without having to enter the main poker room. And unlike many Las Vegas casinos, Aria still has boxes available for new patrons. Want to see what the Ivey Room looks like? Watch PokerNews' video of the grand opening celebration. Comfort and convenience aside, the players all agree that the Ivey Room's best feature is the food. Players in the big game can order gratis from any restaurant on the property, including ultra-posh Vegas hot spots like Barmasa, Sage, Sirio, and Julian Serrano. The Ivey Room is serviced by the "villa butlers," the same staff who cater to the highest of Aria's high rollers. And when the Aria butlers bring your food, it's not just any take-out box delivery. They are trained to bring luxury to every part of a whale's stay, and table-side food service is no exception. They present everything just as it would be served in the casino's fanciest restaurants, all without disturbing the poker action. The Ivey Room is designed to serve big-name and big-bankroll players while keeping them in view of the admiring public. "Instead of just poker players, these guys are celebrities. People want to come here to see them," Altwies said. "Our executives understand poker, and they understand that a room needs high-limit action to thrive and to draw people in." He explained that Aria is focused on making its poker room a can't-miss stop for poker fans. "You could have a poker room, or you could have a poker destination, not just a poker room people want to come and play in because it has the best service or the best dealers, but because it's a place they have to come see when they visit Las Vegas." Hosting the city's big game is an important part of the plan to turn Aria into a poker destination. Several weeks ago, Phil Hellmuth played in the Ivey Room game and brought along his friend and poker enthusiast, Michael Phelps. "When Hellmuth came in, the room just exploded," Altweis said. "It just creates that whole vibe." Altweis hopes that the game will increase interest in mixed games, as well as help fill seats as the room as its profile rises as a poker hotspot. Aria already runs plenty of $4/$8 mixed games, but the room would like to add more middle limits to serve as feeders into the big game. "There is a whole new generation of young, talented players who want to test themselves in the live cash arena," Altwies said. "And what better place than the Ivey Room?" OK its not the big game, but you can start your poker bankroll for free with our free $50 no deposit bonus from PartyPoker Also good for a current $7,500 Cash Runner Freeroll Series right now.